Why doesn't Google TV support Google Voice and Chat? Am I the only one who has the question as to why the new Google TV does not support Google Voice and Chat out of the box? It currently only supports Logitech Vid™ accounts. Is this purposeful launch partner omission. The new Cisco Umi interestingly enough supports Video Chat out of the box. Why Google? You usually hit home runs when you're up to bat. 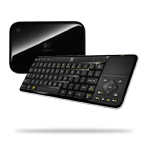 Will we see Google Voice and Chat on non-Logitech branded GoogleTV Units?